During the conference Professor Warren Turner, Dean of LSBU's School of Health and Social Care, presented on the importance of using creative learning to engage with students. Professor Warren discussed how typical MOOCs drop-out rate can exceed 90% but since working with professional filmmakers, this is no longer the case. The new MOOC's each consist of eight-part dramas that play out over eight weeks, ending on a cliff-hanger to inspire the participant to "tune in next week" and find out what happens and to continue their learning to the end of the course. It is through this creative and innovative approach that has seen an increase participation with HSC's MOOCs. Professor Warren along with Professor Sally Hardy Head of Department of Mental Health and Learning Disabilities and Claire Nadaf Principal Lecturer CPPD, also used the conference to further share their work and to see about other opportunities to collaborate with other institutes both here in the UK and across the globe. 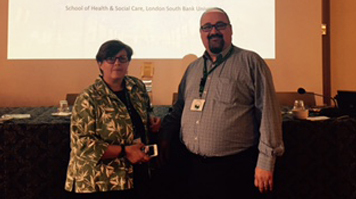 After the presentation Professor Warren said: "We leave the conference with further evidence to support the claim we are leading the way in HSC MOOCs and that LSBU HSC is an organisation with reach and reputation." Professor Warren Turner, Professor Sally Hardy, Senior Lecturer Sue Maddex and Dr Keiron Spires, Principal Lecturer eLearning and Learning Technologies, attended a previous conference on 18-21 February at the famous Planet Hollywood Hotel in Las Vegas. The team's session was held on 20 February, presented on how using episodic drama in a MOOC enhances and structures the learning experience for students, provides a flexible framework for additional learning, and includes an experiential element to online learning.